Washington, D.C., October 24, 2008 - Today, in response to a petition filed by the National Security Archive and several historical associations, the National Archives and Records Administration (NARA) released the previously secret grand jury transcripts of eight witnesses related to Cold War espionage prosecutions. The nearly 300 pages of transcripts from the Brothman/Moskowitz grand jury reveal important new details about the testimony of Elizabeth Bentley, the so-called “Red Spy Queen,” and Harry Gold, who led authorities to David Greenglass and the Rosenbergs. In addition, NARA released the testimonies of Vivian Glassman, Edith Levitov, and Frank Wilentz from the Rosenberg grand jury. The government, through the United States Attorney for the Southern District of New York, had opposed the release of the Brothman/Moskowitz materials. On August 26, 2008, however, Judge Alvin Hellerstein decided they were of “substantial historical importance” and ordered them released. The government declined to appeal that ruling. During the 1940s, Abraham Brothman gave secret industrial information to Elizabeth Bentley, who turned it over to the Soviet Union. Bentley eventually ended that relationship, but Harry Gold replaced her as a conduit to the Soviets. Both Bentley and Gold eventually became FBI informants and provided information that let authorities to Brothman and his business partner Miriam Moskowitz. Both Brothman and Moskowitz were convicted of obstruction of justice and served terms in prison. The Brothman/Moskowitz and Rosenberg cases were linked from the start, sharing some key witnesses and the same cast of investigators and prosecutors. The same judge also handled both cases. 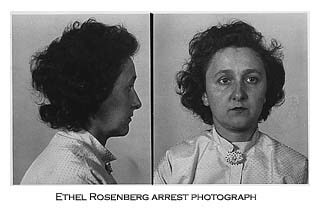 The testimony of several witnesses from the Rosenberg grand jury who are still living and who opposed release, including Ethel Rosenberg’s brother David Greenglass, remain sealed. The petitioners who won the lawsuit to release most of the Rosenberg and Brothman/Moskowitz grand jury records include the National Security Archive at George Washington University, the American Historical Association, the American Society for Legal History, the Organization of American Historians, the Society of American Archivists, and New York Times reporter Sam Roberts. The petitioners are represented by David Vladeck of the Institute for Public Representation at the Georgetown University Law Center, who also served as counsel on the successful Alger Hiss grand jury petition, and Debra L. Raskin, at Vladeck, Waldman, Elias & Engelhard in New York.